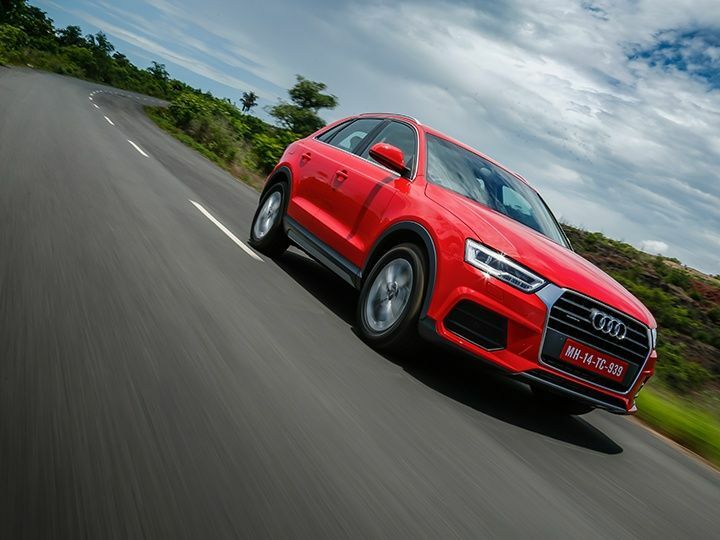 Three years ago, Audi launched the new Q3 in India and we knew that the combination of a German brand, compact SUV and a popular diesel engine would make for an unbeatable package and we were right no our money with our predictions. The Q3 single handedly made Audi reach the number 1 position in the luxury car segment in India and sold brisk numbers. Recently though, the Q3 has come under fire from its German rivals once again, especially from the Mercedes-Benz GLA. Which is why, this, the new Audi Q3, a slightly refreshed version of the car that took the luxury SUV segment by storm is now here in India. So what is new you may ask? Well for the record, this isn’t an all-new car. In fact, it is just a mid-life-cycle facelift and it clearly shows. That said, there are a few changes on the car, some subtle, some not so much. As we mentioned earlier, the differences between the new and old Q3 aren’t really much. Starting off at the front then, the Q3 now gets a brushed silver surround around its slightly tweaked hexagonal black grille. And it gets a set of new LED headlamps with an all-new daytime running light design. Around the side and the back, it is pretty much business as usual though with a slightly reworked set of side skirts, new LED tail lights with a rather aggressive lighting design and a new rear bumper with a diffuser. What we do like though is how Audi has liberally used the brushed silver effect in quite a few places on the Q3 giving it a much more premium and detailed feel than before. The top of the line version we drove also had a set of nice split 5-spoke 17-inch alloy wheels which look like somewhat of an evolution from the ones that are available on the Audi A4. And the silver treatment continues on the interior too. Now normally, although Audi interiors are built to the highest degree in terms of quality, we do find them a tad bit boring. Not anymore though. With a brushed silver carbon feel panel taking centre stage on the dashboard and the centre gear-shift console, the new Q3’s interiors looks miles better than its predecessor. We also like the brushed aluminum finish that the Q3 gets on its centre console that adds a bit more drama to the Q3’s overall interior design. Of course, the Audi Q3 still gets a beige leather interior which is the defacto crowd favorite in India and a new pop up screen to add to the gadget list. The comfortable electric seats are just the same and still offers great all round support and a million levels of adjustment that offers the perfect driving position. The rear seats too offer great lumbar and under thigh support along with adequate levels of legroom even for the slightly larger occupant. The Audi Q3 is a five seater which means that it has a considerable sized boot, which even with the fabric cover on, offers enough space for a weekend’s luggage. As expected, the Audi Q3 comes with an array of features and standard equipment. New to be added to this facelifted version includes a satellite navigation package, a popup screen and a new 20GB jukebox that owners can store multimedia in. The big addition though is that of the new LED headlights that have been offered in the Q3 for the first time. Not only are these really bright as compared to traditional projector beams, they also take much less power to offer the same level of luminosity. Of course, the Q3 also comes with a large panoramic roof and sunroof with an electric sunblind that adds to the desirability of this luxury compact SUV. We have always loved the way the Audi Q3 rides and gladly, not much has changed in this newer version. The suspension is set up for comfort and thus is extremely well sprung, a treat considering most roads in India are either bumpy or riddled with potholes. The Q3 is also easy to drive and look out off especially due to the fact that the glasshouse structure in this compact SUV is quite large. And unlike the GLA which has more of a coupe-ish design that makes looking out of the back slightly difficult, the Q3 is quite easy to reverse and park too. The Audi Q3, like most other Audis does suffer from a slightly lighter steering which does lack feedback and seems to take away some of the driving pleasure. That said, the light steering does have its advantages in urban driving conditions where a car like this will most probably end up spending all its life in. When it comes to handling though, the Q3, with its all-wheel-drive Quattro drivetrain will essentially do what it is asked to do without an aorta of drama. The Q3 even comes with the drive select option which the driver can use to adapt to his personal preferences. These include Comfort, Auto and of course, our favorite – Dynamic mode. And the differences are quite obvious immediately. Where in comfort mode the Q3 is comfortable and does tend to showcase considerable body roll, pushing the button to dynamic immediately tends to stiffen everything up making it a much more agile animal. The updated 2015 Audi Q3 will initially be only offered with a diesel engine and badged as the 35TDI. This familiar 2.0-litre diesel motor too has been slightly worked upon and now delivers even more power which actually makes the Q3 quite a lot of fun to drive especially on the highway. What you also now get for the first time ever are the paddle shifters that let you go through the gears much quicker on the tried and tested seven speed dual clutch gearbox and of course the all wheel drive Quattro drivetrain that lets you put all the 177PS of peak power and a whopping 280Nm of peak torque down to tarmac like its no big deal. All in all, the Q3 is certainly does not disappoint in this department. We expect the Audi Q3 range to be priced almost identical to what it is priced at today. Expect a base model Q3S with the manual gearbox to be priced at about 25 lakhs with the top of the line version we have here priced around the Rs 35 lakh price point. All in all, compared to its rivals, the Q3 is certainly priced very competitively. Also expect the Audi Q3 to return a respectable 15-17kmpl depending on whether or not it has the Quattro all-wheel-drive setup or not. So what implications will this slightly updated Q3 have on the luxury compact SUV market? Well, for starters this new Q3 is certainly an improvement on the original one that it replaces. We particularly like how Audi has managed to make the Q3 make a lot more desirable on the exterior and especially the interior front while still maintaining its identity. That said, even with competition like the Mercedes-Benz GLA breathing down its neck and the new BMW X1 expected to reach Indian shores very soon, we will not be surprised if the new Q3 attracts a whole new set of Indian customers to its fold in the near future. Share your experiences with Q3?